My favorite time of the year is during the Spring and Summer months. Between May and September, I love to take my workout routine outdoors, hiking mountains and biking singletracks whenever the weather permits. But between the tight ponytails, chipped nails, and dry locks from heat and sun exposure, these hobbies can take a toll on my look. Fortunately, with just a few changes to my routine, I’ve been able to keep my hair and nails healthy, strong, and ultimately less prone to damage while I’m out on the trails. Whether you’re looking to prevent damage, or simply maintain healthy hair and nails, here are 5 quick and easy tips, swaps, and mini-routines that take little to no time to do! Ever notice stray hairs right around where you put up your hair? That’s most likely caused by tight hair ties, thin elastics that put too much tension in one spot, or metal fasteners that can catch onto strands and break them (or pull them out all together). A simple switch to thicker, “snag-free” ties can help reduce this breakage, and let you hair grow in longer and fuller. A favorite of mine are these Emi-Jay hair ties. With no metal or glued seams, and thicker bands, they are gentle on hair and super cute. Oil treatments can work wonders on your hair and scalp. Between the antioxidants, vitamins, minerals, and healthy fats, they help to improve your existing locks by conditioning, strengthening, and reducing breakage. And at the same time, they promote healthy hair growth by protecting and nourishing the hair follicles. For all of their amazing and restorative benefits, there’s no reason to skip out on a natural oil scalp treatment the next time you’re at home watching TV, relaxing in a hot bath, or enjoying an at-home facial. It only takes a few minutes to apply the oil, and you can time the treatment right before your shower that morning, evening, or even the following morning (if you’re going for an overnight treatment). All you have to do is pick an oil. Pretty much any natural oil will work, it’s just a matter of finding one that works best for you. Here are three of my personal favorites. Castor oil: Castor oil is known to prevent infections to your scalp (and thus, prevent hair loss), promote healthy hair growth, thicken hair, and seal in moisture to reduce breakage. It’s my personal favorite because it’s so lightweight and easy to distribute through your hair, plus it’s the easiest to rinse out (just one shampoo, rinse, and you’re good!). Coconut oil: Coconut Oil is antibacterial, antifungal and antiviral, meaning it removes bacteria or fungus build-up on the scalp, thus preventing hair loss. Coconut oil also promotes hair growth, reduces breakage, and helps thicken hair. Tip: When buying coconut oil, look for unrefined coconut oil, which is richer in phytonutrients than refined coconut oil. Refined oil goes through a bleaching and heating process that damages the oil’s natural antioxidants. Olive oil: Olive oil of the extra virgin variety makes for an amazing deep conditioner for your hair. It’s deeply moisturizing, which in turn improves hair strength. Olive oil also has antioxidant properties that fights hair loss. It may take a few extra washes to rinse it out, but the results (including incredible softness and shine!) are well worth it! While you’re enjoying that oil treatment, why not add a little scalp massage for extra hair benefits? The benefits of a scalp massage go beyond stress-relief and relaxation. The kneading pressure applied during massage actually warms the skin and opens up blood vessels to increase flow and boost circulation. This in turn helps to deliver nutrients to the cells of the hair follicle, and ultimately promotes healthy hair growth. The process is simple – just pour some oil into the palm of you hand, then, using the pads of your fingers, apply the oil little by little to different parts of your scalp while lifting the hair to expose the roots. Work the oil into your scalp using steady, circular motions for 1-3 minutes. Bonus: After you’re finished massaging your scalp, massage the extra oil into your nails – this will help condition and strengthen them too! Just like our skin, nails require oxygen and water to stay healthy. When our nails are constantly covered with polish, it makes it harder for water and oxygen to absorb into the nail bed, resulting in dry nails that are prone to cracking, breaking, or peeling. To give our nails time to replenish themselves, it’s important to take breaks in between manicures and go polish-free every now and then. 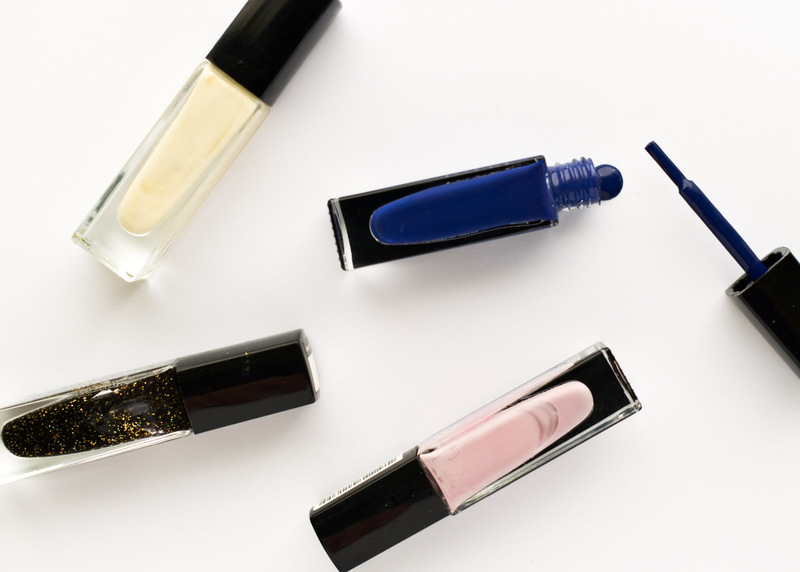 When you are wearing polish, opt for ones that allow oxygen to permeate the nail bed. Julep, for example, has an amazing selection of “breathable” polishes that keep your nails healthy and looking pretty. For healthy nails, eating protein-rich foods (like chicken breast, nuts, and seeds) is essential. Biotin is also beneficial as it helps strengthen brittle fingernails. Finally, make sure to drink plenty of water throughout the day to prevent nails from going dry and brittle. For healthy hair, essential vitamins include Vitamin A,C,E, and B vitamins such as Biotin and Niacin. Opt for foods like salmon, Greek yogurt, eggs, nuts, and spinach, which together contain the vital fatty acids, vitamins, iron, and protein needed for healthy hair growth. While it’s best to get your vitamins through a balanced diet, sometimes our busy schedules can make this difficult. That’s where supplements come in – they’re great for filling in the gaps. On days when my diet takes the back seat, I like to reach for Centrum Vitamints to ensure that I’m getting all the essential vitamins and minerals*. They’re chewable, and great for taking on-the-go. I keep the Centrum Vitamints Cool Mints in my purse (as they double as breath fresheners), and the new Centrum Vitamints Raspberry ones at home (and slightly out of reach, just because they’re too tasty to keep out in the open!). Another fun way to get your vitamins is by taking Centrum Gummies. You can find all these Centrum vitamins at Walmart, in the Multivitamin aisle.